I recently had the opportunity to once again visit Northwest Arkansas. I’d visited Bentonville, Arkansas twice before on business trips. This time I was invited on a press trip to visit both Bentonville and Fayetteville, Arkansas to experience the growing art and culture scene. Our group stayed at two of the area’s top hotels, visited local attractions, ate at wonderful restaurants, and took in the sights. I hope my series of posts will give you a taste of where to stay, some places to eat at, and what to do if you ever find yourself traveling through NW Arkansas on business or if you find yourself driving through that part of the country. Not only is NW Arkansas beautiful, especially in early fall, but it truly is one of the hidden gems of the USA. As I mentioned, I’ve been to Bentonville before and stayed at chain hotels just off the mall both times I visited. So when I was told we were staying at a place called, 21c Museum Hotel, I was intrigued. 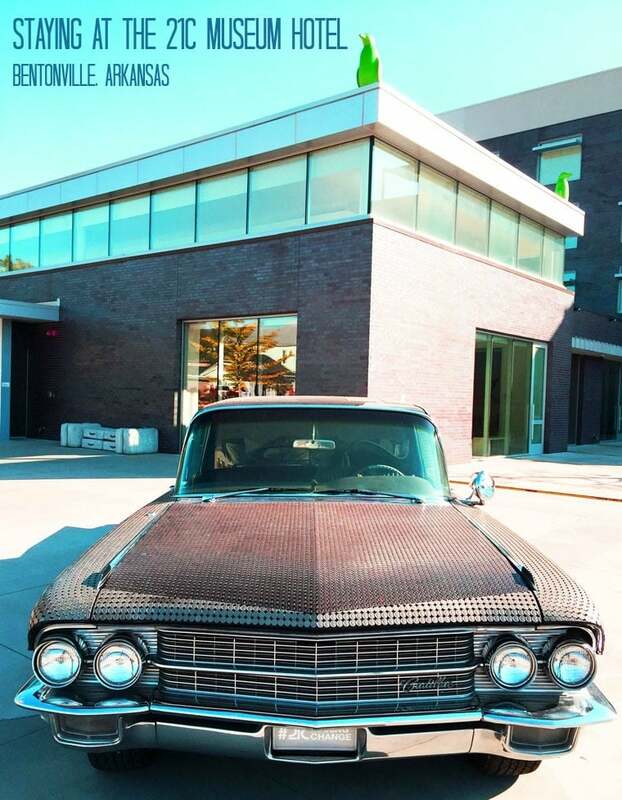 The 21c Museum Hotel Bentonville is a 104-room boutique hotel that’s the combination of a contemporary art museum, a meeting place with swanky bar and upscale eatery called The Hive, and a town hall since they host everything from meetings to fundraisers. Frankly, I couldn’t believe such a venue existed in Bentonville. When did the town get so hip? 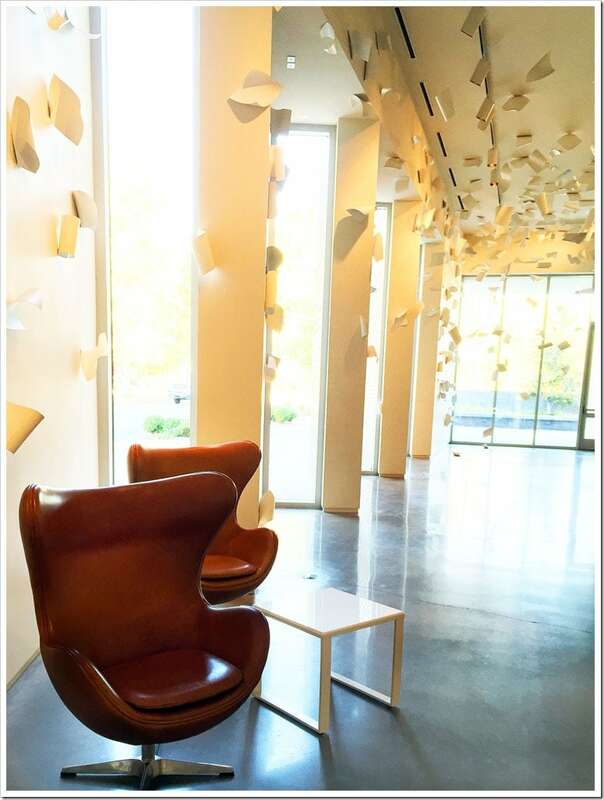 Then I learned that the 21c Museum Hotel Bentonville is just one of a small chain of hotels. 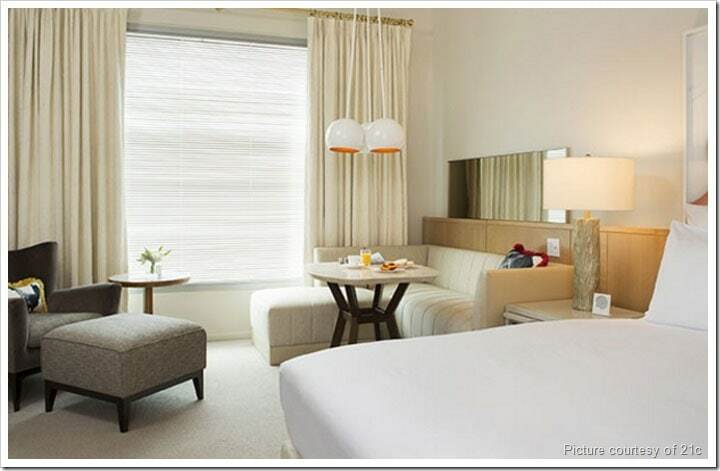 There are also 21c Museum Hotels in Louisville, KY, Cincinnati, OH, and Durham, NC. The 21c concept was started by Laura Lee Brown and Steve Wilson with a belief that art can be an economic driver for a community. Bentonville is the only hotel they’ve built from scratch. All the other 21c hotels were built in existing buildings. 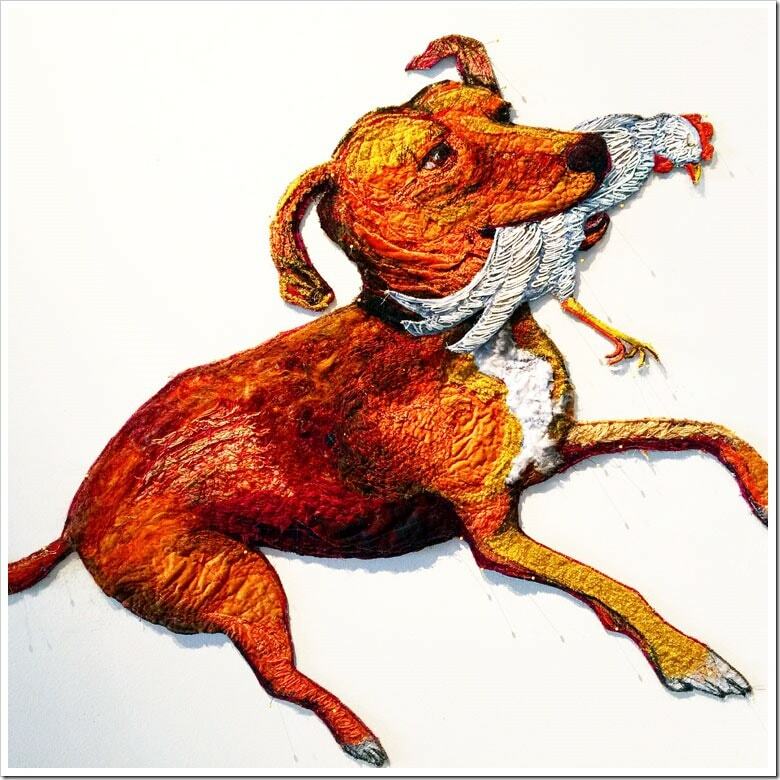 The owners believe in bringing the 21c concept to second and third tier cities that may not have an art scene and have plans to expand next year in Lexington, KY. They will also open hotels in Oklahoma City, Indianapolis, Kansas City, and Nashville. You could tell from the moment you walk in that the people who work at the 21c love their jobs. How refreshing! You’re greeted at the door with a hello and an offer to take your bag. While they take your comfort seriously, it’s obvious the staff is having as good time as you are. 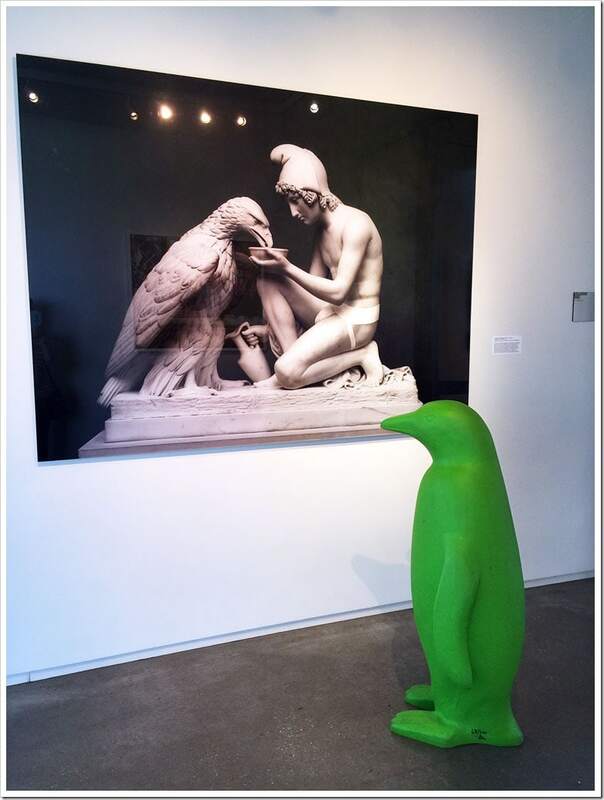 The 21c Museum Hotel is all about enjoyment and whimsy from their art collection (check out the fat Batman on the ceiling of the workout room) to the giant green plastic penguins. The fun is in discovering all the details around each corner of the hotel and in your room, too. For example, if you take the time to read the hotel guide while relaxing in your room, you’ll know what to do in case of a zombie apocalypse. (Stay in your room and wait for help!) 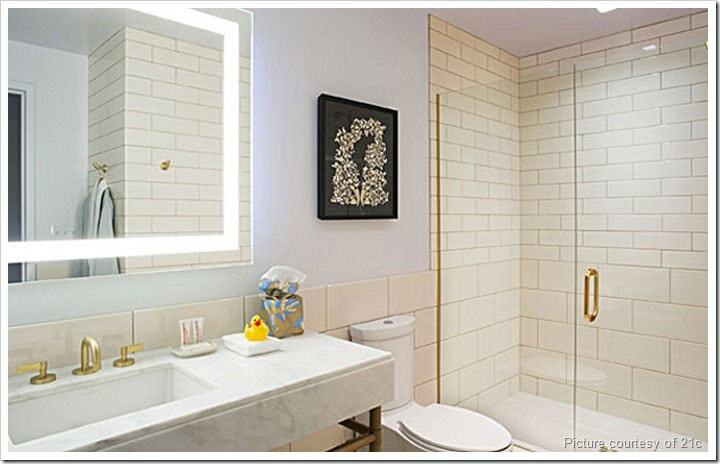 You’ll also want to visit each floor just to check out the wallpaper and artwork. I’ve stayed at some swanky hotels in my time, but I have to say that my room – a King – was one of the nicest rooms I’ve stayed in. I don’t know if it was the comfort of the bed or the quiet of the street outside, but it was one of few times I’ve slept so well in a hotel, too. Everything in my room was in immaculate condition. Don’t you hate checking in just to find that the TV remote is broken or there’s a nasty stain on the chair? 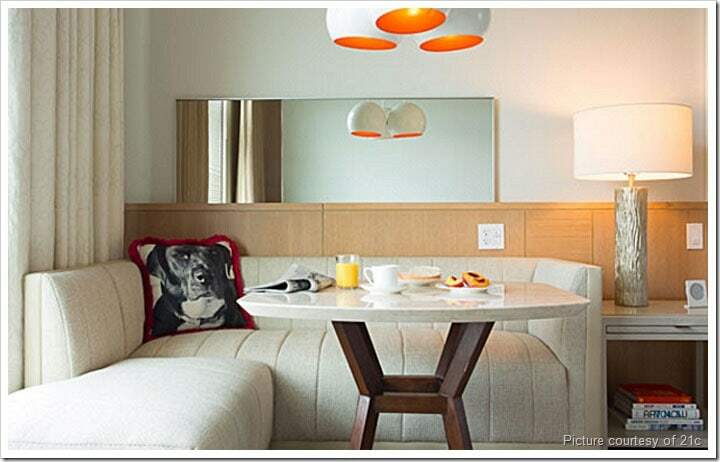 I loved the small touches, too, like the doggie throw pillow and thick terrycloth robes in the closet. Everything in my room was high quality from the bedding to the towels, too. The layout of the room was perfect for working, lounging or eating. Wonderful complementary wifi, too! With a fully stocked mini fridge and Nespresso coffee and espresso maker, I could have worked all day in my room in comfort. I was lucky to have two meals at The Hive, featuring “high South” country creations of executive chef and Arkansas native Matthew McClure. Not only was the food delicious and the portions generous, but the service was excellent. Again, you could tell that the waitstaff and crew at The Hive not only aimed to please, but loved doing their jobs. It made me happy and energized just to eat there. 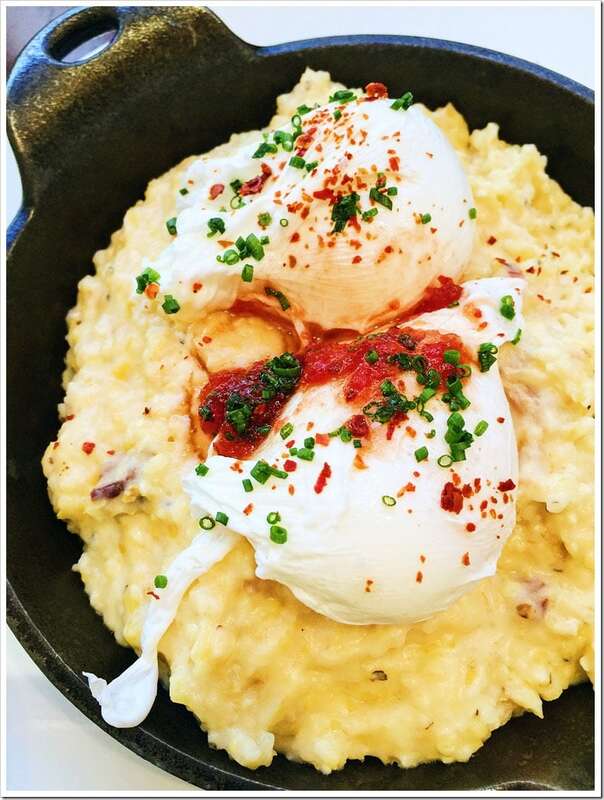 I had the Poached Eggs on Cheddar-Bacon Grits with Tomato Jam for brunch one day. 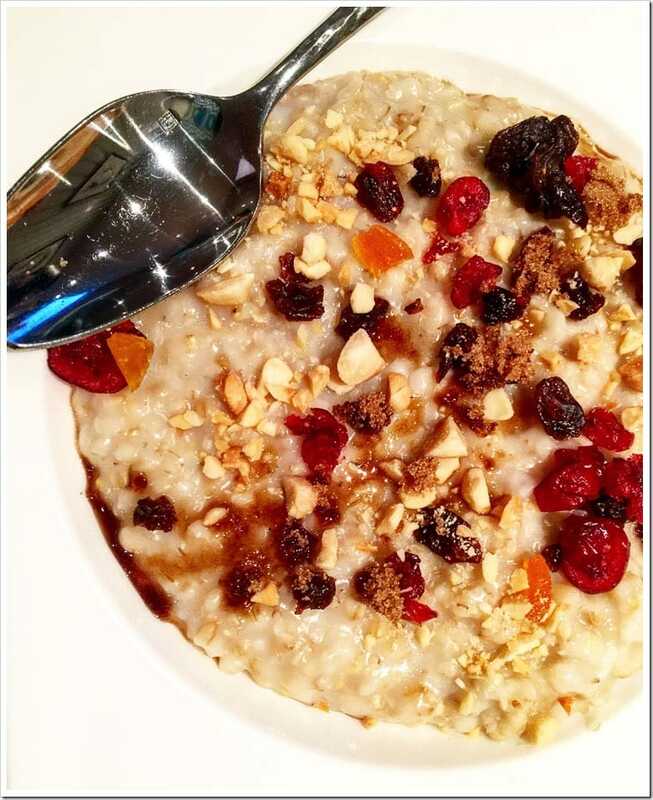 The next day I had War Eagle Steel Cut Oatmeal for breakfast. Both were excellent. At breakfast, General Manger, Emmanuel Gardinier, told us the philosophy of the hotel’s Bar + Lounge was to be a space where “women felt safe.” As a woman who travels for business, I’ve often ordered room service because I didn’t feel safe venturing out, even into the hotel lobby. If I lived in Bentonville, The Hive and the Bar + Lounge would be two places I’d meet girlfriends for meals, drinks, or a quick cup of coffee at any time of day or night. Not because Bentonville is “sleepy,” but because the space is inviting and fun. The highlight of the hotel is, of course, the art. If you’re staying with children, I found the art to be very family friendly – nothing was weird or upsetting. 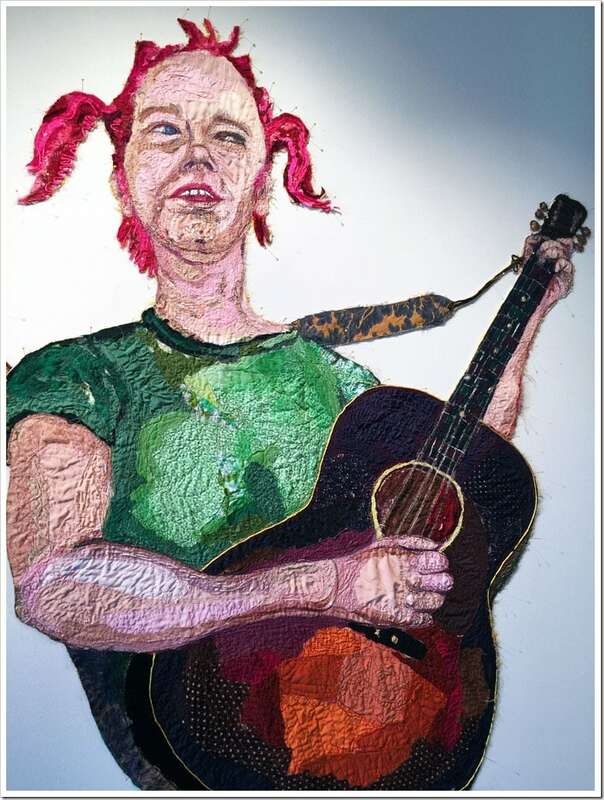 Much of the art that I saw at the Bentonville property during my visit would appeal to children, such as Gina Phillips’s sewn cloth two dimensional dogs and guitar playing girl or the interactive smart wall sculpture by Daan Roosegaarde that you see as you exit the elevator. Of course, kids will love the hotel’s giant plastic penguins. (Each 21c hotel has penguins. The Bentonville ones are green.) You and your children can play a game to find where the penguins are as the hotel staff moves them around the entire hotel throughout the day. Many pieces are part of the hotel’s permanent collection and come from the founders’ personal art collection. The art in the Bar + Lounge is changed ounce per year. Artwork in other parts of the hotel are changed twice per year. 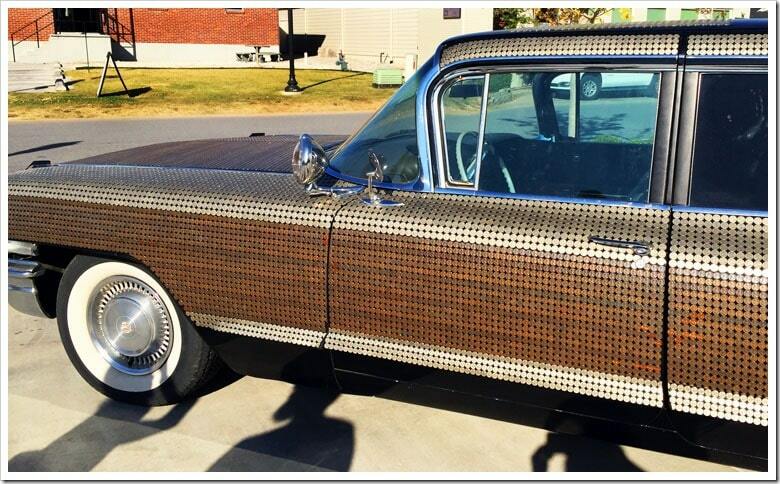 Art is not only inside the 21c, but outside as well, such as Monica Mahoney’s Making Change, a Fleetwood Cadillac limousine covered with thousands of nickels, dimes and pennies. The inspiration for the coin motif comes from the original Walton Five and Dime, still located on the Bentonville town square. You can read more about Making Change here on the 21c Museum Hotel website. There is also more information on Current Exhibitions. The 21c Museum Hotel Bentonville is also dog friendly. Give them a call at 479.286.6500 for details on their pet policy and special doggie amenities. The hotel is close to the Bentonville town square and within walking distance of the Crystal Bridges Museum and the Amazeum. If you’re a bike enthusiast, the hotel is near 20 miles of trails including pedestrian pathways and bikeways as well as world class all-terrain mountain bike trails. The hotel can supply you with free cruiser bicycles or bike rentals through a partnership with a local bike shop, bike storage for guests and employees, and bike valet. If you wish to work out, the 21c has a good sized workout facility located on the first floor. 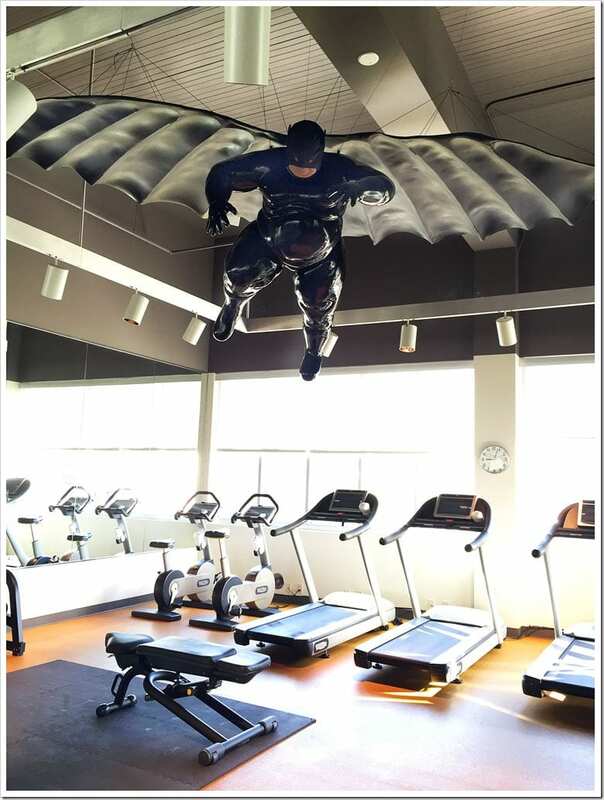 Even if you’re not planning to workout, you must visit the facility to check out the fat Batman hanging from the ceiling! The only thing 21c lacks is a pool, though I’m sure they could point you to the nearest rec center if you need to swim a few laps. All in all, I cherished my time at 21c Museum Hotel Bentonville, was sad to leave, and am looking forward to visiting some of their other properties around the US. Posted in Travel and tagged Arkansas on November 20, 2015 by Anne-Marie Nichols.